One free box will be added for every 10 ordered! All boxes come with roofs unattached. Treated roof to increase longevity. Built to mount with Gilbertson conduit rebar system. $12 shipping and handling for first box, $7 for each additional. 1 9/16″ hole, additional ventilation can be added on sides upon request. 1 1/8″ hole and wood-burned chickadee on door. $10 shipping and handling for first box, $4 for each additional. *PVC box must be squeezed to open/monitor which may prove difficult for anyone with weak hands. An educational 18 x 24 print by artist Roberta Lee. 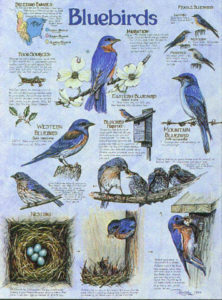 Depicts all three species of bluebirds and their nesting cycle. Works well for educational displays or for display in your home.